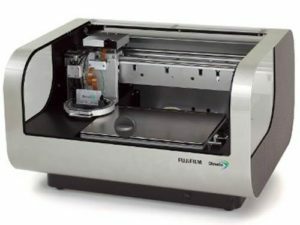 The DMP, powered by Fujifilm Dimatix MEMS piezo inkjet technology, is an ideal bench-top system for research and development of inkjet technology and fluids for a wide variety of applications. The 16 nozzle MEMS printhead is capable of producing drop volumes from 1-10 pL and is compatible with water-based, solvent, UV, acidic, and basic fluids resulting a truly versatile tool for imaging and deposition of fluids onto a large variety of materials such as plastic, glass, silicon, and ceramics. 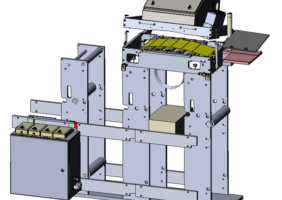 A 200 mm x 300 mm printable area and height adjust of up to 25 mm accommodates most parts with flat or complex geometries. Finally, optimization of waveform and jetting parameters can be accomplished by using the built in drop watcher. Contact Integrity to discuss how the DMP can be used to meet your laboratory and process development needs. We sell and support these printers, and assist clients with their applications. 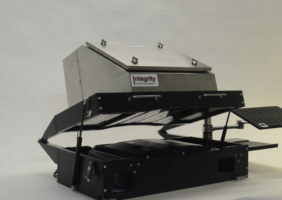 Integrity is offering PEL’s UV LED Curing System for the Dimatix DMP. 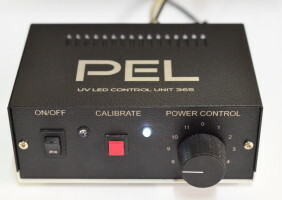 The low-profile UV LED Lamp integrates with your DMP and print process software allowing for rapid UV ink-based process development and optimization. Print whole image, followed by a second scan over the image to cure or pin. Integrity is an official re-seller of this technology in the US. It is available in the EU directly from PEL. System requirements: The DMP PC must be running Windows 7, and must be running the latest DMP software (available from Dimatix). Integrity is also a reseller of the Dimatix DMP. Contact us for more information about a complete solution for your UV development needs. 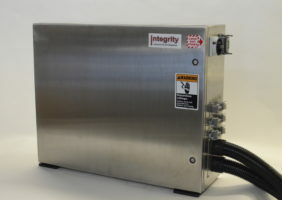 Integrity’s DB400 is a customizable, modular, and highly configurable system ideal for developing industrial inkjet processes for a wide variety of DOD Piezo printheads. 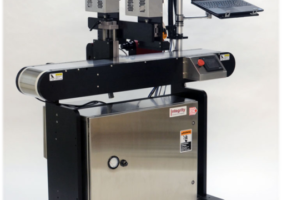 The pairing of Integrity’s Universal Print Controller and variable speed steel belt drive provides unparalleled versatility for engineering and inkjet development teams. 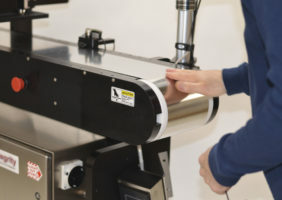 Designed to support single-pass print and capability testing for one or more heads, the deck allows flexible mounting options for both heads and sensors. 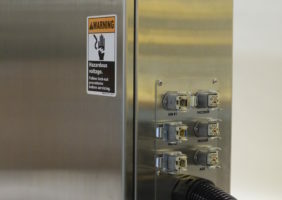 All options and accessories are modular, so the system can be configured specifically for your application and testing requirements. Versatile and Scalable Inkjet System Controller that allows you to explore different inkjet printhead technologies. The Universal Print Controller is powerful enough to move with your development cycle, from R&D to a full industrial integration. 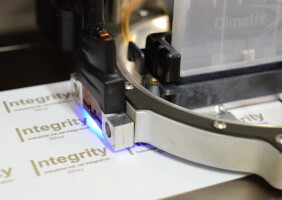 Integrity’s Universal Inkjet Print Controller can be configured to drive up to 8 printheads from multiple vendors such as Dimatix, Xaar, Kyocera, Toshiba Tec and Konica Minolta. Compatible with Dimatix, Kyocera, Ricoh, Toshiba Tec, Konica Minolta, Xaar, Xerox, etc. 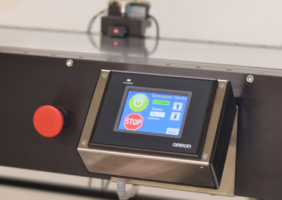 The universal print controller is aggressively priced as part of a development package designed to take you from feasibility to development to production, making the most of your investment during every phase of your process development cycle. The base unit includes the ability to drive one head, with licenses available for additional heads as needed. Printhead configuration is user changeable. The versatility of digital printing customized to meet your business and resource needs. 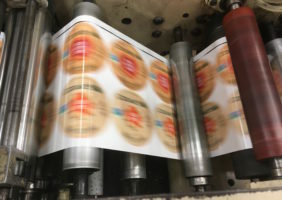 In today’s fast paced, highly customized and personalized world, the business of label and package printing is being transformed. Rise to meet market demands by retrofitting existing equipment with high resolution inkjet to create a versatile hybrid that integrates the best features of analog and digital printing. 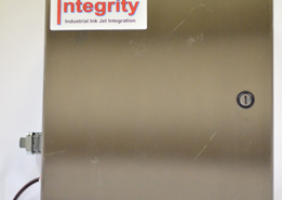 Contact Integrity today to discuss your application needs with our engineering team. 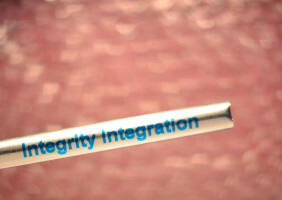 Integrity understands the importance of fluid management in inkjet systems which is why we offer an Ink Delivery module and a Recirculating Reservoir that can be used independently or together. 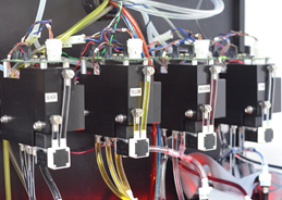 The Ink Delivery module is designed to be used with a variety of fluids and is tailored to deliver ink at the proper rate based on usage by the choice of pump. 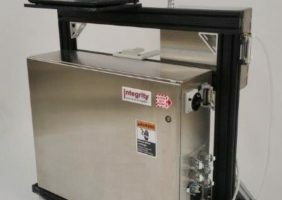 For fluid management closer to the jetting mechanism, Integrity’s Recirculating Reservoir is ideal, providing constant fluid circulation through the printhead, reservoir chamber, and an in-line degassing unit. This combination assures your fluid is always at the ready for optimum performance.